The Department of Energy is proposing a revision in the rules under which a permanent geologic repository for high level nuclear waste, namely Yucca Mountain, would be considered suitable. In order to "align the suitability guidelines with the latest science and scientific analytical techniques for assessing repository performance," DOE is proposing revised Yucca Mountain Site Suitability Guidelines, 10 CFR 963. Among other issues, DOE's proposed rule making (10 CFR 963) would alter the criteria for determining whether a potential repository is likely to meet the radiation standards both before and after closure. These standards would be set by the Environmental Protection Agency (EPA) and subsequently adopted by the Nuclear Regulatory Commission (NRC). DOE says that the proposed revision is necessary in order to remain consistent with the regulations proposed by these two agencies. However, critics of the proposed repository hold that the new guidelines will make it possible for DOE to declare Yucca Mountain suitable for a permanent geologic repository when it may actually be unsafe. The original guidelines weighed several factors separately such as the amount of time it takes radiation to travel through ground water, the likelihood of seismic and volcanic activity, and the cost to build a repository. If Yucca Mountain fell short in any one of these areas, DOE could have been forced to abandon the site. Under the proposed rule this checklist is replaced by a single guideline so that no one factor can disqualify the project. The new guidelines also shift reliance from the geologic features of the mountain to man-made barriers such as waste canisters and underground shielding. Nevada officials protested the revision when it was first proposed last November because they believed that Yucca Mountain would fail on the basis of groundwater movement. With the proposed changes, potential groundwater contamination alone would not be enough to disqualify the Yucca Mountain site. DOE held a 90-day comment period on the proposed regulation change that ended in February. But although DOE received and considered 100 comments on the new guidelines, the final version sent to the NRC for approval in May was not substantially changed. DOE hopes to include the approved guidelines in the Site Recommendation Consideration Report, which is currently scheduled for a November release. After years of study, the Department of Energy (DOE) is nearing the point where it must ultimately decide whether or not the proposed Yucca Mountain site is suitable for permanent geologic disposal of the country's high level nuclear waste. Since 1987, when Congress amended the Nuclear Waste Policy Act to target Yucca Mountain as the sole site for study, DOE has been testing and gathering evidence about its potential to store more than 70,000 metric tons of highly radioactive waste for tens of thousands of years. In 1998, DOE published the Viability Assessment, a document presenting "comprehensive site information" that found the Yucca Mountain site "viable" and concluded that studies should be continued. The next step in the process was the draft Environmental Impact Statement (EIS) which was released for public comment in July of 1999. The document analyzed the predicted performance of the proposed repository as well as the potential effects it could have on the surrounding environment. The report concluded that a "repository would pose little risk to future populations near Yucca Mountain." While Department of Energy officials believe Yucca Mountain remains "viable" citizens voiced their doubts in more than 11,000 comments submitted on the draft EIS. The EIS comment period lasted nearly 200 days ending in February of this year. DOE is currently analyzing these comments and preparing responses that will be documented in a final EIS comment response document. Under the Nuclear Waste Policy Act, DOE must complete the final EIS as part of the site recommendation process. According to DOE, the final version is set to be released in July of 2001. DOE is also preparing the Site Recommendation Consideration Report (SRCR) which will include descriptions of the proposed repository and waste packaging. It will also discuss site characterization data and repository performance analysis. Set to be released in December, the SRCR along with the final EIS will provide the technical basis for the Secretary of Energy's decision on whether or not to officially recommend the site to the president. According to DOE's Office of Civilian Radioactive Waste Management (OCRWM), the key issue to be addressed in the SRCR is whether a repository system would present "any unreasonable long-term risk to the public after permanent closure." Ivan Itkin, director of OCRWM, says that the project is "nearing a point where the scientific information will be adequate to determine whether a repository for spent fuel and high-level waste at Yucca Mountain could be operated, monitored, and closed while protecting the health and safety of current and future generations and the environment." Like the EIS, the SRCR document will be opened to public comment. It will also undergo an in-depth site characterization and engineering design review by the Nuclear Regulatory Commission (NRC). The SRCR will then be forwarded to the secretary by June of 2001. If the secretary finds the results favorable and decides to recommend the site to the president, the governor and state legislature of Nevada will be notified immediately so that they may voice their disapproval. In turn, if the site is deemed suitable by the president and Congress, Yucca Mountain will be effectively designated as a future high level waste repository and DOE will continue with the license application process. Construction will only begin after the site has been licensed by the NRC with waste emplacement planned to begin as early as 2010. The Nevada state engineer has denied a Department of Energy request to pump groundwater at the Yucca Mountain site. The decision, made this February, stated that the application would not serve the public interest and could lead to litigation between the state and federal governments. Following testimony from the state attorney general, the Nevada Nuclear Projects Agency and environmental groups, the engineer — who previously had issued water permits — determined that "it may not be in the economic interests of Nevada to have a high-level nuclear waste repository at Yucca Mountain, and that the siting . . . at Yucca Mountain causes considerable public concern." The engineer based his decision on a state statute that prevents any person or governmental entity from storing high-level radioactive waste in Nevada. A new report commissioned by the City of North Las Vegas says that the chances of an accident involving radioactive material in the Las Vegas valley are 1 in 90 within the next 24 years if shipments of nuclear waste are taken on the Las Vegas Beltway en route to Yucca Mountain. The still incomplete northern leg of the beltway runs through North Las Vegas, Las Vegas, and Clark County. The study, conducted by Lewis Berger & Associates, assumed that 50,000 shipments of nuclear waste would travel this road to Yucca Mountain. Based on traffic statistics and the information in the draft Environmental Impact Statement (EIS) published by the Department of Energy (DOE) last year, there could be up to 3 accidents within 24 years, according to the report. Nevada Senator Harry Reid said, "This study confirms what common sense always has told us — the more material you ship through an area the higher the chance of an accident that will spill the material in that area." The study also points out that there would be hazards even if no accidents occur. The drivers of the heavy-haul trucks that carry the waste would be exposed to measurable doses of radiation, as well as people who live or work close to the roads used as shipping routes. The beltway, scheduled to be completed in 2001, passes through 7,500 acres of land that may be turned into master-planned communities, bringing in an estimated 197,000 residents living within 2 miles of the roadway. City officials claim that DOE did not take such growth and transportation issues into account in the draft EIS — DOE has yet to comment on this most recent report. The final EIS, which will attempt a thorough and conclusive evaluation of all the possible impacts of the proposed repository at Yucca Mountain, is due by summer of next year. The Nuclear Regulatory Commission (NRC) has just finished the draft Environmental Impact Statement for a reactor-waste storage site proposed for the Skull Valley Goshute Indian reservation in Utah. 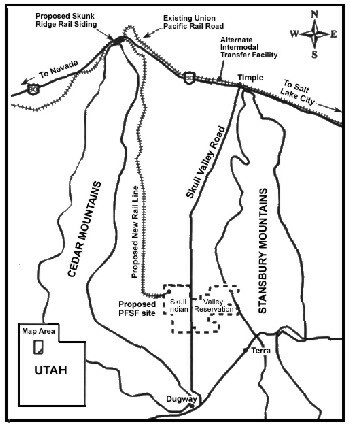 In 1997 a consortium of nuclear power-plants, the Wisconsin-based Private Fuel Storage (PFS), applied for a license to store up to 40,000 metric tons of uranium wastes on 40 acres of the reservation, located about 85 miles southwest of Salt Lake City. The facility, if approved, would temporarily store the spent fuel rods until the federal government provides permanent storage. Yucca Mountain is currently the only site under consideration for a permanent waste repository. Members of the tribal government invited the company to bring the waste to its Utah land in hopes that the jobs and revenue brought in by such a facility will rejuvenate its economy. There are strong supporters and strong opponents of the project within the tribe. Utah officials, however, are staunchly opposed to the proposed dump. Utah Governor Mike Leavitt holds that temporary storage will increase risks to public health and safety as well as the environment. State officials also fear that the facility could become permanent if the Yucca Mountain site is not approved. But because the temporary storage area would be on tribal land, the state has no jurisdiction over the decision. Nevada officials, who are keeping a close eye on the proceedings due to the effects the outcome may have on the licensing process of the proposed Yucca Mountain site, have joined Utah in opposition to the potential storage facility. State officials contend that "a central interim storage facility — especially one located in the west, thousands of miles from the most of the country's power reactors — is not needed." And that "by considering PFS's application for a facility, NRC is exposing thousands of communities around the nation to transportation risks and impacts that are not being assessed and that are wholly unnecessary." Nevada officials are concerned that the proposal for the Utah facility is based on the assumption that the Yucca Mountain site will ultimately be proved suitable for a permanent repository, which they are opposed to. The consortium needs NRC approval before it can build the storage facility and the permit review currently underway will take at least another two years. Construction and waste shipments could begin as early as 2003. In late July, NRC held hearings in Utah on its draft Environmental Impact Statement (EIS) on the proposed facility. The level of interest was so great that NRC added a public hearing on August 21 in Salt Lake City before the September 21 Draft EIS comment deadline. As promised, President Clinton vetoed legislation in April that would have allowed for the storage of thousands of tons of highly radioactive waste at Yucca Mountain. SB 1287 would have cleared the way for thousands of tons of spent fuel building up at reactors in 31 states to be shipped to Nevada starting in 2007. Earlier this year the House of Representatives approved the bill 252-167 with the Senate approving it 64-34; neither had the two-thirds majority needed to override a presidential veto. Nevada's political leaders, who have spent years fighting the proposed Yucca Mountain repository in Congress, were pleased with the decision. The nuclear industry, however, criticized Clinton's decision, stating that the federal government should be moving faster to resolve the country's dilemma over nuclear waste. The White House's objection to the bill was based in large part upon a provision that would have blocked the Environmental Protection Agency from setting the radiation exposure standards for the proposed repository until the next president takes office. The bill would have also taken away the Secretary of Energy's power to unilaterally increase the fees the nuclear power industry must pay towards repository development. In his seven years as Nye County's main technical voice on the Yucca Mountain Project, Joseph "Nick" Stellavato earned a reputation as a jovial, no-nonsense expert who valued good science above all else. Stellavato died July 21st at Sunrise Hospital in Las Vegas shortly after undergoing five-way heart bypass surgery. He was 58. "Geology has lost a good friend," said Tom Buqo, consulting hydro-geologist for the Nye County Nuclear Waste Repository Project Office. "He was a fine scientist who has done more than anyone else in the last five years to further the studies at Yucca Mountain, because he put his efforts where they were needed." And he didn't get distracted by politics, despite his involvement with such a politically charged issue. "He had scientific ethics and morals, and he stood by those beliefs," said Kevin Rohrer, the Department of Energy's liaison to Nye County. He was also a "stellar guy" with a "heart of gold" who brought credibility to Nye County's oversight efforts, Rohrer said. "The people of Nye County have lost a huge ally in our attempt to get the best science possible," said County Commissioner Cameron McRae. Buqo echoed that sentiment. "His loss is going to be felt not only by Nye County, but by the whole program." Buqo added that the staff at Nye County's oversight office is committed to finishing the work Stellavato started. The U.S. Department of Energy (DOE) is responsible for characterizing, and if authorized to do so, constructing, managing, and operating the proposed geologic repository at Yucca Mountain. To ensure the health and safety of workers on-site, DOE must follow Occupational Safety and Health Administration regulations. DOE is currently studying Yucca Mountain to determine if it is suitable for a permanent repository; DOE works with the Department of Interior's U.S. Geological Survey on site characterization issues and activities. If the site is approved to accept radioactive waste, DOE would obtain a license to construct, operate, monitor, and close the repository from the Nuclear Regulatory Commission (NRC). More information on DOE's role in the Yucca Mountain Project can be found at http://www.doe.gov or http://www.ymp.gov. The Nuclear Regulatory Commission (NRC) is an independent regulatory agency responsible for determining whether DOE will receive a license to construct and operate a high-level nuclear waste repository at Yucca Mountain. The NRC is also responsible for developing the technical requirements for geologic disposal and implementing health-based radiation standards established by the Environmental Protection Agency (EPA). The NRC will issue a license to DOE only if DOE demonstrates that it can construct and operate a repository safely and in compliance with NRC's regulations — NRC licenses bear the primary responsibility for the safe use of radioactive materials. The NRC also regulates the design, construction, use and maintenance of containers used to ship nuclear waste. These casks must be designed to withstand a series of impact, puncture, and fire environments to ensure that they would not be breached in a serious transportation accident. The NRC reviews the cask design and then must issue an approval certificate for the design before the cask can be used to transport radioactive material. A schedule of public meetings is located at http://www.nrc.gov/public-involve/public-meetings/meeting-schedule.html. Their web address is http://www.nrc.gov. The Environmental Protection Agency (EPA) is responsible for the development of site-specific, health-based standards for the proposed Yucca Mountain repository. These standards are designed to protect the public health and environment from harmful exposure to radioactivity from the nuclear waste that would be disposed of in the proposed geologic repository. EPA's standards address environmental pathways: air, groundwater, food, and soil. The standards developed by the EPA will be implemented and enforced by the NRC. Find out more information at the EPA's website: http://www.epa.gov/radiation/yucca. The Department of Transportation (DOT) regulates shippers and carriers of nuclear waste as well as the conditions of transport, such as routing, tie-downs, vehicle requirements, handling and storage. If waste transportation to Yucca Mountain is authorized, DOT must ensure that waste carriers comply with routing regulations and guidelines. Radioactive waste carriers must be trained to tackle a variety of transport conditions and situations which include rough terrain and severe weather conditions. Drivers must complete a First Responders Course to help them prepare for the prevention and response to any possible incident. Go to http://www.dot.gov for more information. The Advisory Committee on Nuclear Waste (ACNW) is an independent oversight body that provides technical advice to the NRC. The scope of the ACNW's advising includes transportation, storage, and disposal of radioactive waste including interim storage, materials safety, decommissioning, application of risk-informed, performance-based regulations, and evaluation of licensing documents, rules, and regulatory guidance, among other issues. The ACNW reports directly to the Commission on the NRC staff's nuclear waste management activities and interacts with representatives from the public and other Federal and State agencies in order to provide a public forum for the various stakeholders to express their concerns. Find more information at http://www.nrc.gov/ACRSACNW. The Nuclear Waste Technical Review Board (NWTRB) is an independent agency of the U.S. Government. Its purpose is to provide independent scientific and technical oversight of the U.S. program for management and disposal of high-level radioactive waste and spent nuclear fuel from civilian nuclear power plants. Their web address is http://www.nwtrb.gov. Scientists at the Los Alamos National Laboratory, N.M. say a process that reduces the harmful effects of radioactive waste and could lead to a new alternative for the disposal of the country's spent fuel is currently under development. 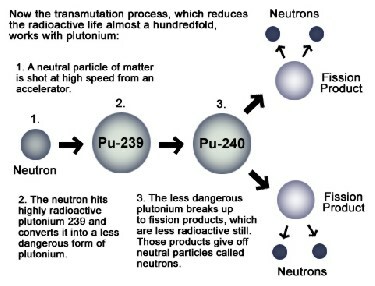 The process is called transmutation and it dramatically reduces the volume and toxicity of nuclear waste, such as plutonium, by bombarding it with neutrons from a high-powered accelerator. Scientists predict that transmutation will yield much smaller amounts of toxic waste that would only need to be stored for 300 years. This is opposed to the 10,000 year minimum that wastes buried in a geologic repository would take to decompose to safe levels. Transmutation could make the need for a permanent repository, currently proposed for Yucca Mountain, much less urgent. However, technology this advanced is still some years and millions of dollars worth of research away. According to the Department of Energy, the first full-scale transmutation machine would take 20 years and $187 million to finish. In addition, some are not convinced that the benefits of transmutation outweigh the drawbacks. In May, the Institute for Energy and Environmental Research, a group of independent scientists, released a report that advised the government to abandon research on transmutation. The report held that the process is extremely expensive and would create large volumes of low level radioactive waste while transforming only a small portion of highly radioactive waste. Even still, scientists think that transmutation could be a viable alternative to dealing with the country's high level nuclear waste and the method is still under investigation — if not to solve the problem of the waste that exists today, at least to help prevent such a buildup of toxic radioactive material in the future. Congress has already spent $4 million on transmutation research and approved another $9 million this year.